I've had a little bit of a short attention span this week, so I've been working on the various units that make up the star blocks in my Radiant Jewel quilt. All of my flying geese units are pressed and trimmed. For the center of the blocks, the directions tell you to make randomly patched four-patches out of 2.5" squares. I decided that I would strip piece mine using one of the black prints and the cream/gold print. I also set aside the 2.5" squares I'll need for the border units. I also started working on the very, very many small four patches that are in the star blocks and the border units. 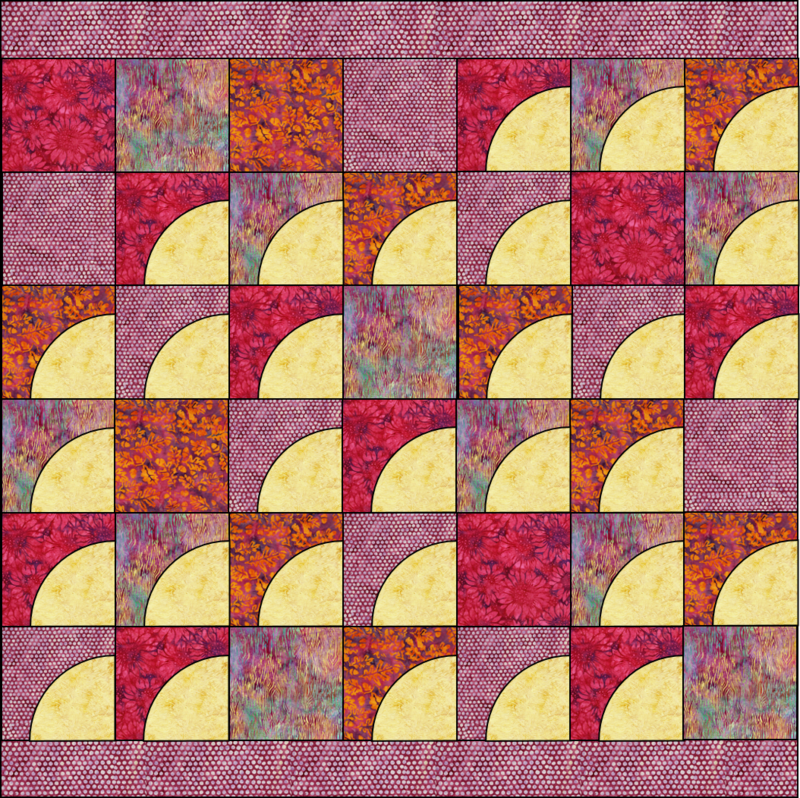 The quilt requires 172 of these four patches that will finish at 2" in the quilt! While I still need to make about 100 more of these tiny four patches, I laid out my first star block to see what it will look like. The vast majority of the tiny four patches are used in the pieced border. This has been a good project to work on this week since it's so fun and the fabrics are so beautiful. This weekend I need to get myself in gear to finish at least something or work on something with a real deadline rather than just fun things for myself. 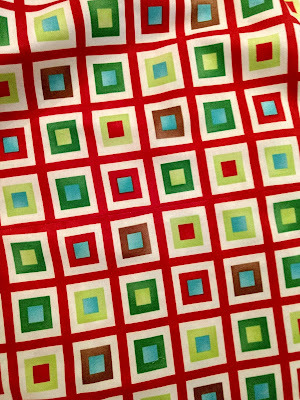 For my first checkerboard border, I decided to go with red and light green. The red dot is a fabric that I used for the binding of one of my Little Firecracker quilts and the green is left over from my Little Bunny Placemats and I also used it in my Magnolia mystery quilt. For my second checkerboard, I went with my paisley print and dark green. 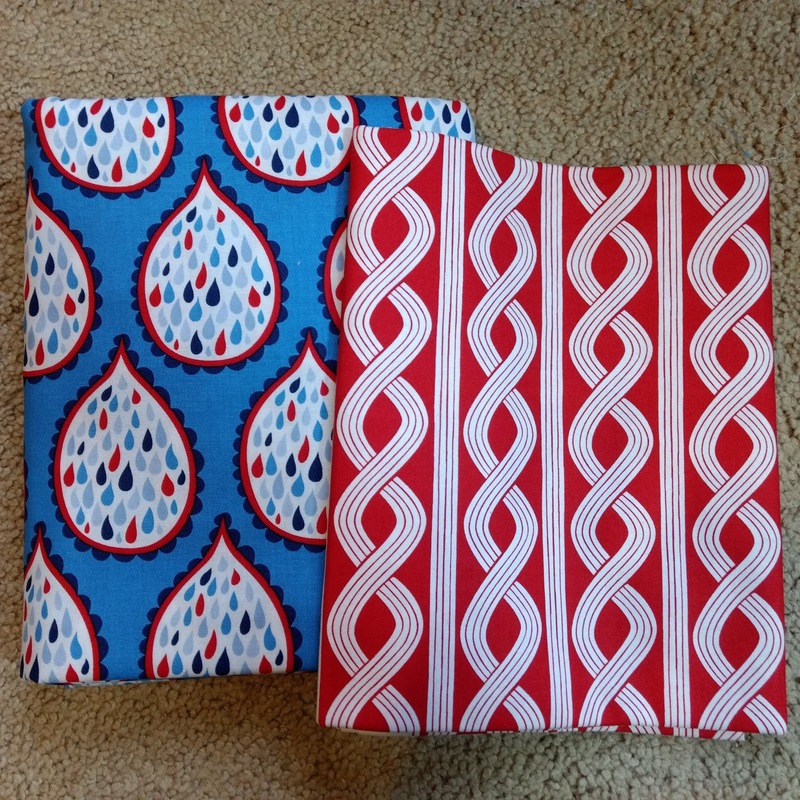 Both of these fabrics are ones that have just been hanging around in my stash for a while. The next round will be sawtooth stars! I'm hoping I have enough fabric to at least get through adding all of the sawtooth stars and then a final background border. 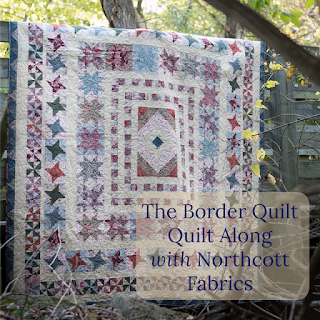 Check out some of the other versions of the quilt by some great bloggers! While I showed a little peak of my Radiant Jewel quilt beginnings in my retreat post, I didn't share a lot about my plans for this quilt. The quilt has two main blocks -- the diamond blocks that I started on retreat and star blocks. While on retreat I was able to finish 11 of the 17 diamond blocks needed for the quilt and I started the HSTs and flying geese for blocks #12 and #13. This weekend was the first time working on this project since retreat and I quickly finished the last of the diamond blocks. I'm very happy with my blocks and as you might be able to tell in this picture, I picked the largest scale prints for the diamond blocks. This quilt is all based around working from one jelly roll and one charm pack so all of the flying geese and HSTs for the diamond units are made with the stitch-and-flip method. If I were to make this quilt again, I wouldn't make these blocks using this method and would find a more fabric efficient way to make the blocks. 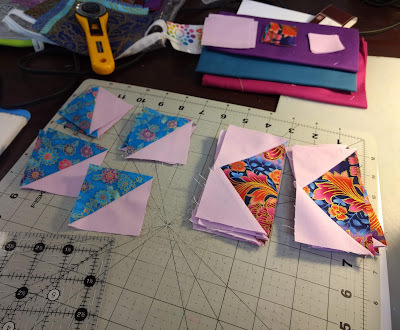 However, I did decide to ignore the directions to make the flying geese for the star blocks using the solid fabrics since I had continuous yardages of these fabrics instead of precuts. I have 72 all-solid flying geese to make for my 18 star blocks -- I'll have 6 stars in each of the three jewel tones. My original hope was that I would be able to have enough leftover fabric from the quilt to make extra blocks to enlarge the quilt. However, when the kit and directions say to "cut carefully, there's almost no extra!" that's probably not a possibility! Part of this is how inefficient some of the cutting is -- one of the next steps is cutting down some of my 2.5" strips into 1.5" strips to make smaller four patches -- that much waste is a killer! Add that in with all of the stitch and flip units, and my heart aches. Happy Monday -- I hope you get to do some sewing today! This post could also be titled "I am bad at leaders and enders." I absolutely LOVE the idea of leaders and enders -- a side project that you have going in an effort to save thread and use scraps. 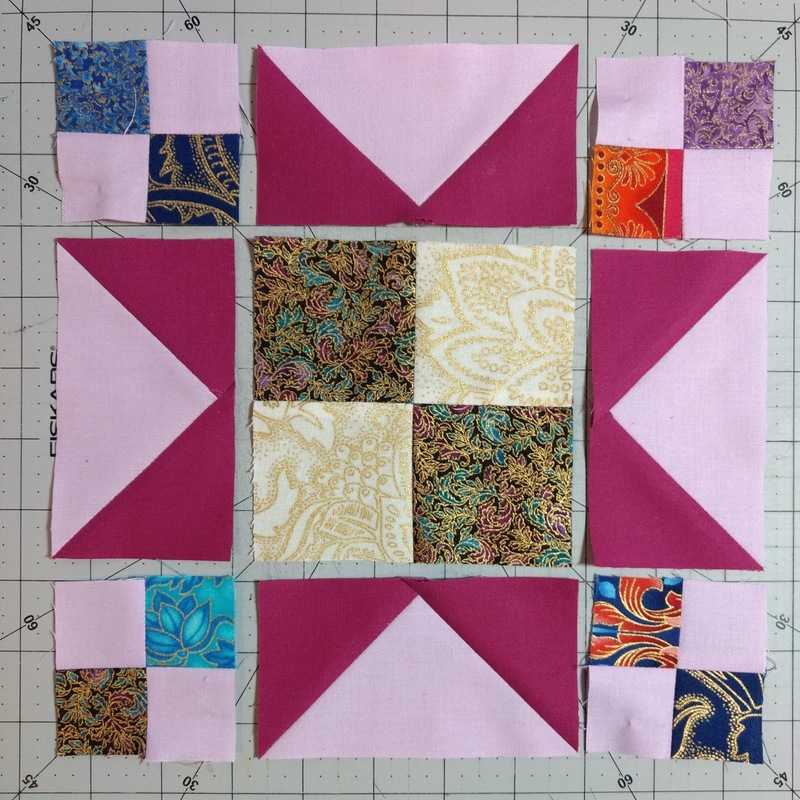 Bonnie Hunter is a leader and ender pioneer and I decided that I wanted to join in on her "leader and ender challenge" for this year making Jewel Box Star blocks. As you can see, I arranged my four patches so that one diagonal of the block has green squares and one diagonal has red squares. All of my HSTs use the same blue background floral. But backing up -- I am not good at leaders and enders. Instead of what you're actually supposed to do with leaders and enders, I tend to just use it as a "filler" project when I have a few minutes here and there to sew. I guess maybe this is just what works for my brain and my tiny sewing space. 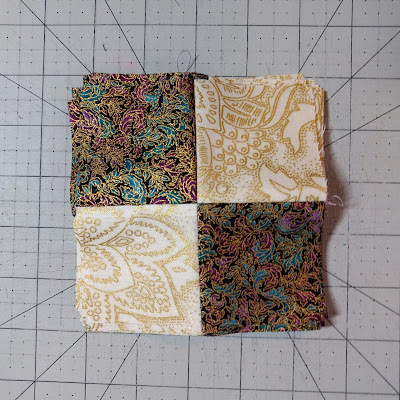 I decided that instead of working on more blocks to add to a quilt, I would just turn these four blocks into a long and skinny table runner. 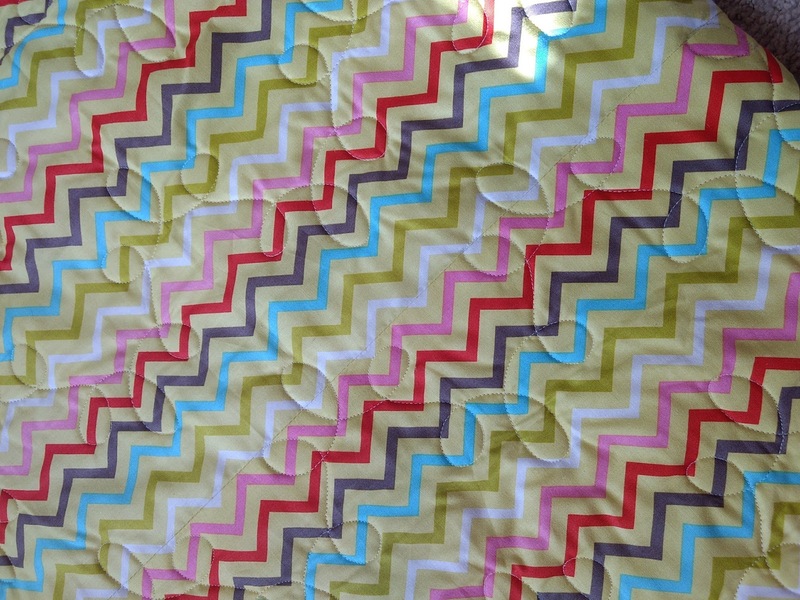 I also had this great zig zag print hanging out in my stash that I chose for the backing and binding. I did have to piece the backing since this table runner is 48" long. 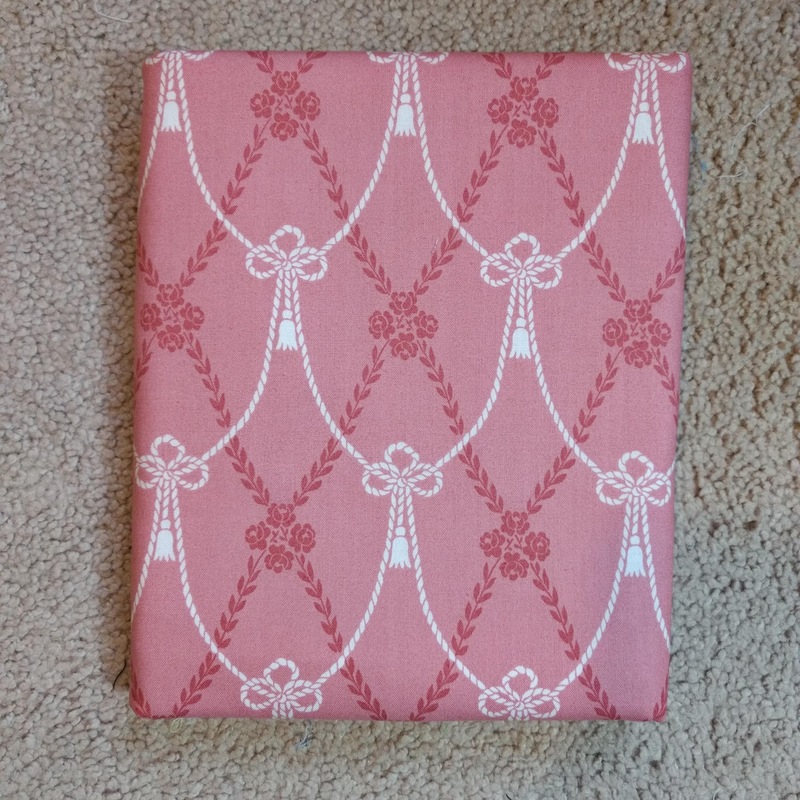 I used my tutorial for matching prints to make the necessary seam a little less obvious. I also was able to use the batting scraps left over from my Pansy Garden quilt. For the quilting, I did more swirly flowers in white Aurifil thread. I used the leftover fabric from the backing (I had a whole yard of this fabric) for the binding. Because the runner is 48" x 12", I needed four WOF strips for the binding -- three strips was *just* too short. I top stitched the binding with a dark green Aurifil thread that is similar to the darker green in the zig zag print. Here's a close up of one block in the table runner -- the binding and backing fabric is a perfect pair with my navy floral print star points. And just for fun -- lots of stripey goodness when I rolled up the runner. Happy Friday! Sharing at Brag about your Beauties and Finish it up Friday! Size: 12" blocks, runner is 48" by 12"
Future: Might be a gift, might not, haven't decided! The best thing about making baby quilts is that I'm not (usually) tempted to keep them! The worst part is that for every one that I make, I get ideas for at least two more swirling around in my head. For the quilting, I did a swirly flower filler in white Aurifil thread. The flannel backing is a similar teal to the teals used in the top of the quilt. For the binding, I used this very fun checkerboard batik that came in my second Island Batik Ambassador goody box. 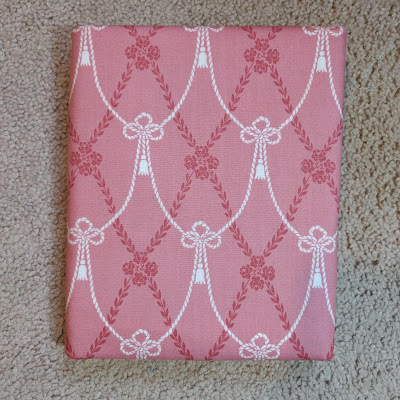 I got this print in three colors (pink, purple, and teal) and I am excited to use it again soon because of how neat this binding turned out. I think it could be even cooler as bias binding. Hopefully this quilt will be loved and snuggled for a long time! This pattern is now available on Etsy and PayHip!! Sharing at Let's Bee Social and Needle and Thread Thursday! Also at Finish it up Friday! 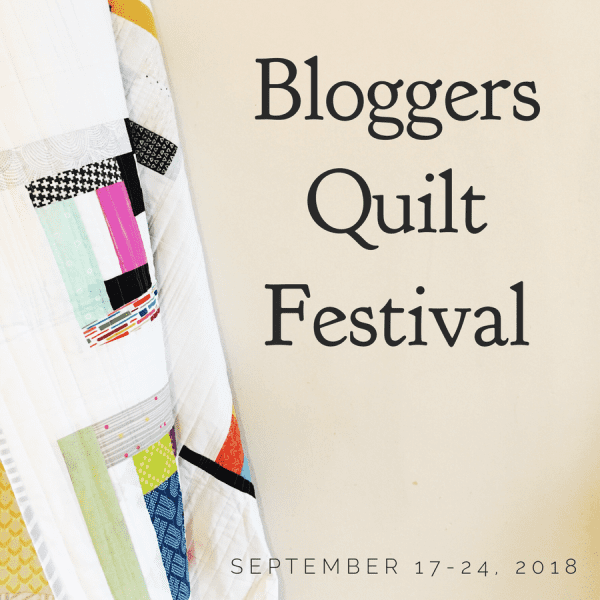 It's a good week to be a quilter -- it's time for the Blogger's Quilt Festival, hosted by Amy's Creative Side! For this year's edition of the festival, I decided to enter my 30 Pearls quilt. This quilt is my own original design and was my Island Batik Ambassador project for June, which was our "modern" themed month. When I was thinking about designing this quilt, I took my inspiration from the fact that I was coming up on my 30th birthday. I decided that I wanted something with 30 simple blocks and it seemed the natural choice to do drunkard's path blocks since my birthstone is pearl. This was my original design that I mocked up using a few of the fabrics I planned to use. The fabrics for this came from Island Batik's Sunflower Serenade line and used only the pink, red, and purple fabrics. I used a set of drunkard's path templates I had from a previous project and the blocks and quilt top came together with ease. The backing is an extreme contrast from the front -- it's lime green with slice and insert strips of rainbow fabrics added to make the backing big enough. 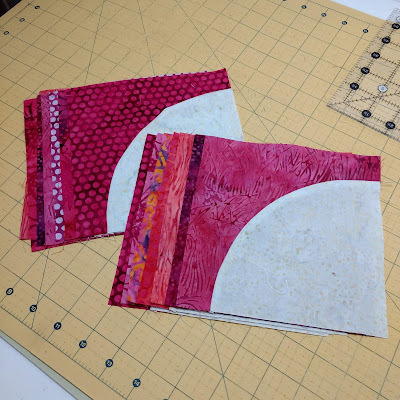 For the quilting, I quilted pebbles in white Aurifil in each of the white pearls. For each of the print arches or squares, I used a different free motion quilting motif inspired by Leah Day's quilting design gallery. I used 56 different free motion fillers and used five different colors of pink, red, purple, and orange thread. This quilt now hangs above my sewing machine in my little corner of our guest room. This quilt is not larger (42 inches square) but I see it as something I am hugely proud of with how much I worked on the free motion quilting. Thanks for visiting me -- and go to visit all of the other lovely bloggers too! Today I wanted to take a quick detour and do a more in depth tutorial about pattern matching larger scale prints for nearly invisible (or at the very least, less visible) seams for backings. For some fabrics -- smaller scale prints, solids -- pattern matching is kind of unnecessary. But sometimes, with directional fabrics or some styles of large scale prints, just sewing two pieces of fabric together results in a very obvious seam location. Some people won't be bothered by this, but some people are and I am definitely one of those people. 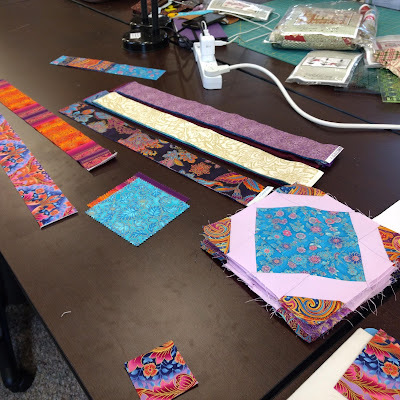 An important note: different kinds of prints require different thought processes about how to match the print repeats and where to place the sewing line. Can you find the seam? It's between the white and pink stripes in the middle of this photo. For this print, the points of the zig zags were used to line up the print and the seam runs along the tip of the pink points and intersects with the tip of the white points. For this print, the seam is within the red stripe running across the picture from left to right. 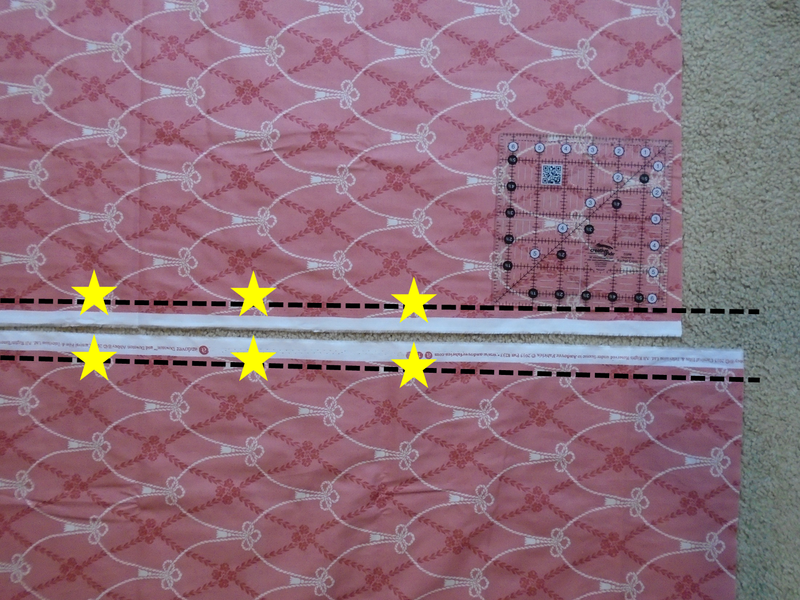 I aligned the fabric using the red stripes running up and down through the fabric and placed my seam line in the middle of the red edge stripes running left to right. Today, I'm going to show an in depth example of how I match patterns. 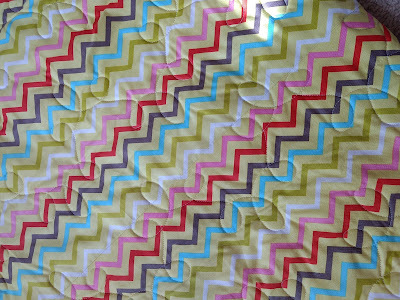 I'll be working on piecing a backing using this fabric (which I got from the clearance section at the Fat Quarter Shop online from a Downton Abbey fabric line) which is directional. 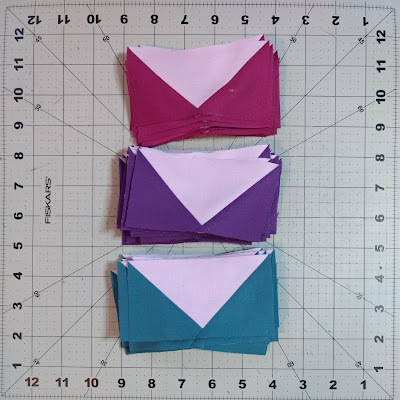 To get the tassels to hang all in the same direction, I'll need to sew together the two pieces of backing (approximately 2 yards each, 4 yards total) along the opposite salvage edges. (I also added the ruler for scale) If you fold your backing in half lengthwise and sew along the same side of the selvage, your tassels will hang in opposite directions. Now I'm going to look long and hard at the print and think about two things -- where I want to place the seam line and what "landmarks" to use to align the fabric. If you're a spacial thinker, the seam line will run parallel to the salvage and the "landmarks" are the places in the print along the length of the fabric that you'll use to align your two pieces of fabric. 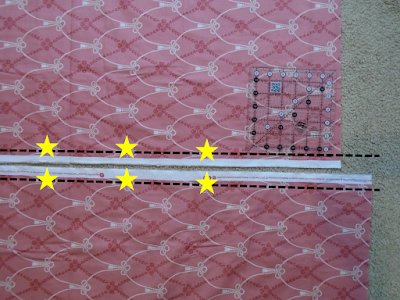 This photo is the same as the photo above with my projected seam lines (one dashed line on each piece of fabric) and my "landmarks" (marked with stars). I am going to align the two pieces of fabric such that I pin at each of the tassels, which will be my landmarks. I am going to sew through the knots -- which ends up being about an inch from the fabric edge -- along the length of the fabric. I don't like to trim my salvages prior to sewing the backing seam. I prefer to sew my seam and make sure that it's situated properly first and then to trim the salvage off. I also am totally okay with this seam being larger than 1/4" after I trim off the salvage since I will press this seam open (which I do for all of my backing seams). And ta-da! I have a moderately well-matched seam that fades into the overall print of the fabric. The tassels along the seam are slightly more narrow, but the overall repeat of the print is not broken, which is the most important factor. At a glance, I think I'll need to sew through the middle of the raindrops across from left to right. This one might end up being slightly more obvious given the detail of the little raindrops on the inside of the larger raindrop motif, but I think with a little extra love it will blend together. Are you a pattern matcher or are you someone who avoids this kind of matching at all costs? Tell me about your pattern matching experiences in the comments! 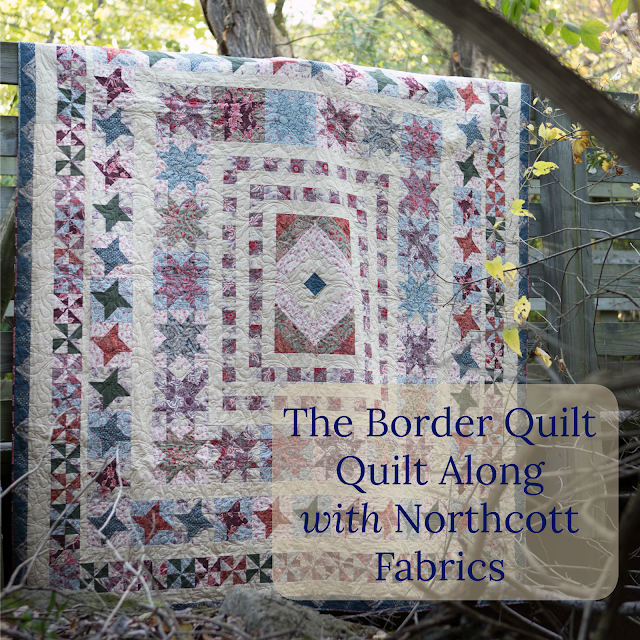 After a momentary delay, the start of the Border Quilt QAL is here! 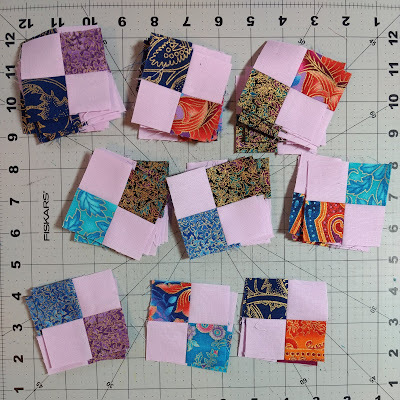 If you haven't joined in yet, there is still plenty of time to do so -- check out all of the information on Jen's blog and see Jen's first post about her flannel version of the quilt here! To refresh your memories, I'm making my quilt from scraps in more traditional colors with a Kona Champagne background. The paisley print in the bottom center is my "inspiration fabric" for this quilt. There are batiks, traditional prints, and more modern prints mixed in with this fabric pull. This week we're starting the center of the quilt and I chose to do the pieced version of the center since I'm working with scraps rather than yardage. Now back to the grind until it's time for week 2! The rain here in Maryland is preventing me from getting good pictures of some things that are finished/nearly finished, so here's hoping that Florence changes course and just goes back out to sea. Check out some of the other bloggers sewing along! Today I'm your host for the Words To Live By Blog Hop with Benartex! This new line designed by Cherry Guidry is a fun combination of prints, including text, keys, and daisies! 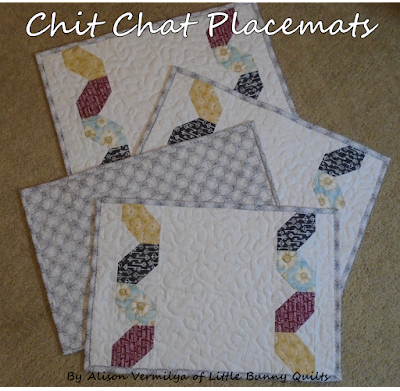 I'm always looking for new ideas for quick and easy projects like table runners and placemats that are easy gifts. These kinds of projects are perfect for using batting scraps too! 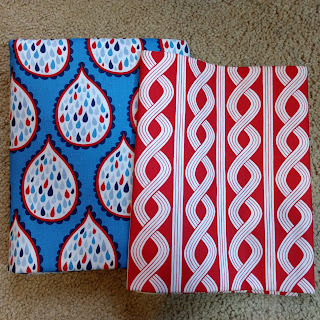 I decided to make some simple placemats using 3.5" squares using these fabrics. Let's get sewing! Four (4) backing rectangles approximately 15" x 20"
Note: If using one fabric for your backing and binding, cut your binding strips first from your 1.5 yard cut of fabric, then cut your remaining fabric (approximately 34" long) into four quarters for your four backing pieces. To opposite corners of each 3.5" square, use the stitch and flip method to add a 2" background square to the opposite corners. Some people call this unit a "half snowball" some people call it a "pop bead" -- whatever you might call it, you'll need eight of them for each placemat and 32 if you're making a set of four placemats like me. Sew your pop bead blocks into sets of four, making eight sets of block strips. Since I am using four different colors, each of my sets has one of each color. I made half in one pattern and half in a second pattern. Arrange two 12.5" x 2" rectangles, two pop bead block strips, and one 12.5" x 9.5" rectangle as shown below. 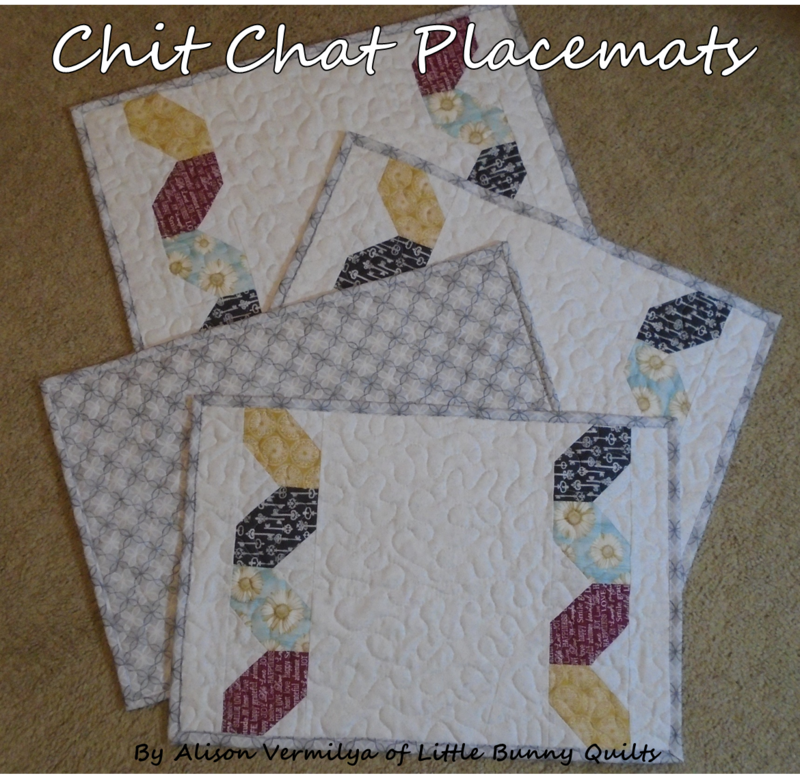 Sew together to complete the top of your placemat. Make four placemat tops, which should measure 12.5" x 18.5". Thanks for allowing me to share this quick and easy tutorial! This would make an easy gift and a great way to use some of those seasonal fabrics that you always have hanging around in your stash! 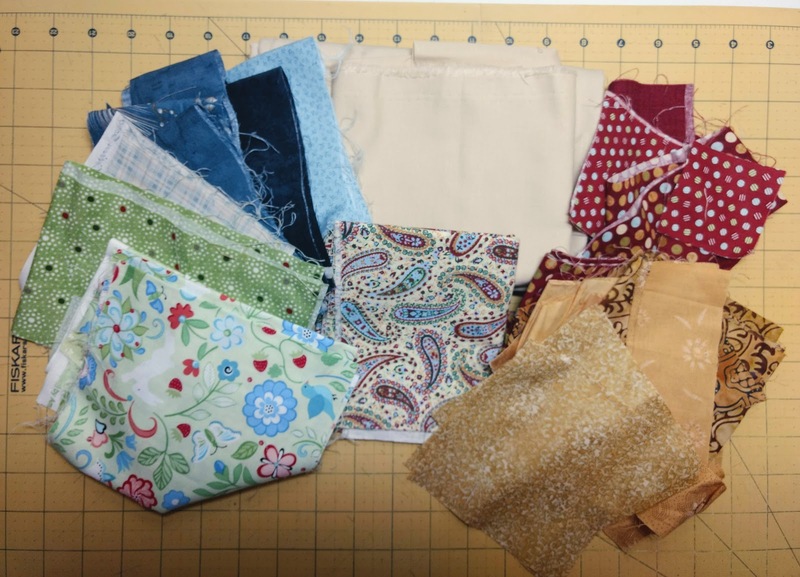 --Leave a comment and tell me your favorite type of quick-and-easy quilting and sewing projects. --If you follow Benartex fabrics on Facebook or Instagram, leave a third and final comment. Giveaway will close at midnight on Sunday, September 16th. Thanks for visiting and check out the other posts on this hop! Congrats to our winner, Lisa Marie!